For brand manufacturers, the digital shelf is today’s growth opportunity. With 77% of shopping journeys starting in a search bar, brands must invest in the people, processes, and technology to orchestrate the product experience for the digital consumer. To better understand how brands are tackling this current market landscape, Salsify recently conducted its annual survey of 200 ecommerce, sales, and marketing leaders at brand manufacturers. The results uncover substantial, increasing pressure on brands. The data also reveals the organizational strategies and future investments that leaders and active brands plan to adopt to keep pace and successfully navigate in this environment. Methodology: The data outlined within this report was generated through a survey of practitioners across 200 brands within the North American marketplace. The survey was administered by EchoCove Research and conducted over the course of Q3 2017. Brands that do not sell their products online on any channel were not included in the sample. All survey respondents hold roles relating to the creation and management of online product content. Using spreadsheets to keep track of product content internally may have been adequate 10 years ago, but today it represents a direct threat to a brand’s business. likely to grow larger, as the share of surveyed brands using software systems grew 37% since last year. Based on these results, we expect brands who exit 2018 without updating their processes and technology will find themselves increasingly behind their peers in digital commerce. Nearly 20% of brands spend more than 100 hours per week managing product content. That is a full workload for 2-3 full-time employees. However, companies with marketing teams managing product content, rather than IT, spent 14% less time on these tasks each week. Research is clear that online product content impacts consumers’ purchase decisions online and offline. Brands that win on Amazon and other online retailers are those that constantly adjust their keywords, copy, and content to align with user behavior. These aren’t things an IT department can deliver. Yet, more than one in three companies surveyed task IT with managing their product content. The impact of this decision is tremendous. 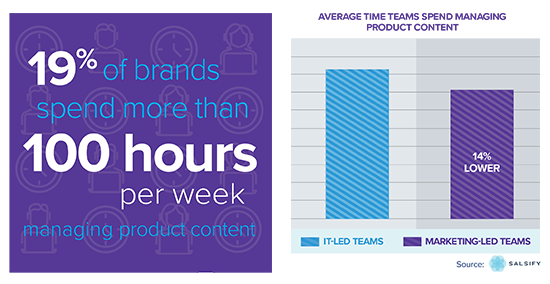 The brands with IT managing product content spend substantially more hours doing so every week. That’s real money lost, and likely is accompanied by lost agility. Manufacturers need to put the keys of product content in the hands of marketing or dedicated ecommerce teams who are closest to the customer and the target consumers. There is a notable frustration across survey participants when it comes to working with retailers. Across all company sizes, 90% of brands surveyed identified key frustrations with retailers. Tellingly, the three most pervasive issues across all groups were lack of business insights, differing retailer criteria, and complicated item set-up processes. Modern commerce is demanding. Retailers are increasingly reliant on brands to help them sell goods. They request better copy, more images, videos, and additional product data. Some retailers change their content requirements daily, even hourly, in response to consumer behavior. Despite these increasingly dynamic adjustments, most retailers’ processes for communicating these changes to brands are stuck in the proverbial dark ages - spreadsheets thrown over the wall. While leading brands have staffed up significantly added technology in response, these antiquated methods for communicating with retailers are impeding success for all parties involved. Additionally, many of these same retailers continue to be stingy with data flowing back to brands, despite the overwhelming knowledge that data-backed decisions lead to better outcomes. It is absolutely critical in 2018 that brands pressure their retailers to invest in bi-directional APIs that eliminate spreadsheets, enable rapid feedback and updates, along with the sharing of performance data to drive continuous sales improvements. times can mean lost sales, limit a brand’s ability to quickly respond to consumer trends, and negatively impact brand equity. Much of these lengthy refreshes relate to a reliance on spreadsheets or manual processes to update product content. Walmart and other retailers are opening up direct connections that directly address some of these issues. More retailers need to streamline and automate what should be a closed-loop process, so brands can constantly improve performance. Meanwhile, brands need to take advantage of existing direct connections and also demand this level of access across retailers. There is a notable disconnect between the retailer- oriented concerns of manufacturers held by the “boots on the ground” versus the C-suite. 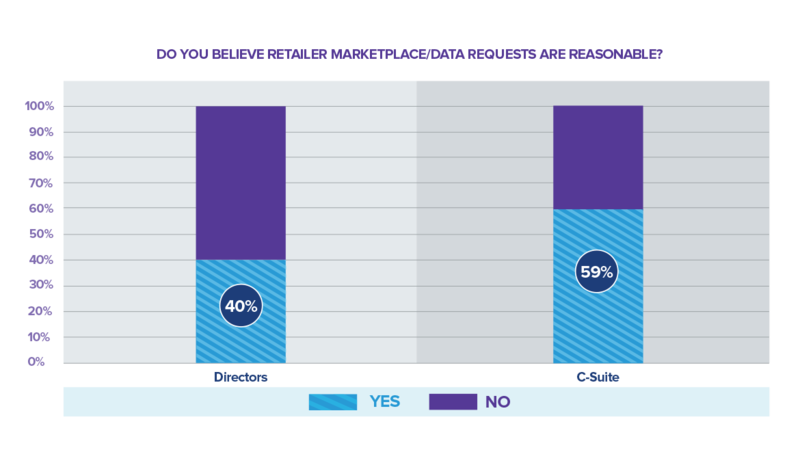 59% of C-suite respondents thought retailer data requirements were reasonable - only 40% of directors felt the same way. succeed in ecommerce. Directors and those actually managing product content must ensure executives understand where their pain points are. Those who work for ecommerce departments must advocate for systems that will improve performance. This is about the long-term health of the business, which needs to be as equipped as possible to operate effectively across a changing online retail landscape. 10 brands have existing direct-to-consumers (D2C) operations, a substantial jump from 73% in 2016. Close to 60% of D2C-enabled companies are marketing these activities on a region-by-region basis. Regionalization is not a new phenomenon, and global manufacturers generally understand the value of this concept when it comes to selling on their own sites. However, this approach must also scale to online retailers with locally-optimized content. The temptation to standardize and control product content centrally across geographies, with language being the only variant, flies in the face of best practices. Brands need to empower localized teams to control content in order to drive better outcomes, with a backstop of some form of centralized governance. A sizable 37% of brands understand that beyond growing sales and market share, ecommerce must build brand awareness. Product pages are brand marketing vehicle. With traditional forms of mass media losing reach and effectiveness, consumers discover brands when they search for or filter by the product attributes they want on a retailer’s site. Alongside conversion rates and sales as critical KPI’s, leading brands should include digital and retailer marketing investments in their mixed market models to understand the impact of content in a broader context. Manufacturers are focused on growing their sales presence across a diverse set of channels in 2018. Roughly 40% of surveyed brands identified social media and/or D2C channels as top priorities. This suggests that manufacturers are focused on driving more sales by better meeting consumers on their terms. While the wide array of high-priority channels has the potential to sidetrack ecommerce operations, a full 79% of brands surveyed said they would dedicate more resources the retailers that provide performance data back to suppliers. Greater visibility can help brands make better decisions. The result is richer content for the retailer, more frequent content updates for consumers, and a greater ability for brands to adjust quickly to new demands from retailers and consumers. In 2018, brands should focus their efforts on channels that offer a meaningful impact on the business, operational efficiency and insights on the digital shopper. Brands need to pressure their retail partners for increased levels of data access. Retailers should recognize this key opportunity to create great shopping experiences and gain market share. The battle for talent will be incredibly fierce over the next 12 months. Two-thirds of brands say they plan to grow their product content management teams. The days of a small team holding this role are decidedly over, particularly as product content becomes a major piece of a manufacturer’s brand marketing strategy. By the same token, all marketers should become ecommerce-literate in order to ease this transition and best position themselves going forward. Successful companies understand that knowledge of the intricacies of selling on Amazon, Walmart, and other channels needs to be matched with branding acumen and market awareness to achieve long-term sales growth.